Kai’ili Kaulukukui was born in 1981 on the Big Island of Hawaii. Even as a young child, Kai had a great interest in creating, and began drawing at an early age, inspired by Hawaii’s natural beauty, abundant ocean life, and rich native culture. Kai was a BFA candidate at the University of Hawaii Windward campus where he studied under Snowden Hodges who has a deep base in classical techniques of oil painting. Simultaneously, he was trained in oil by apprenticing with Dennis Morton. Later, he transferred to the School of the Art Institute of Chicago. He has been immersed in shark culture, imagery and information that has sparked his imagination. Based on his research, lately Kai’s works illustrate compromised sharks and aquatic environments. 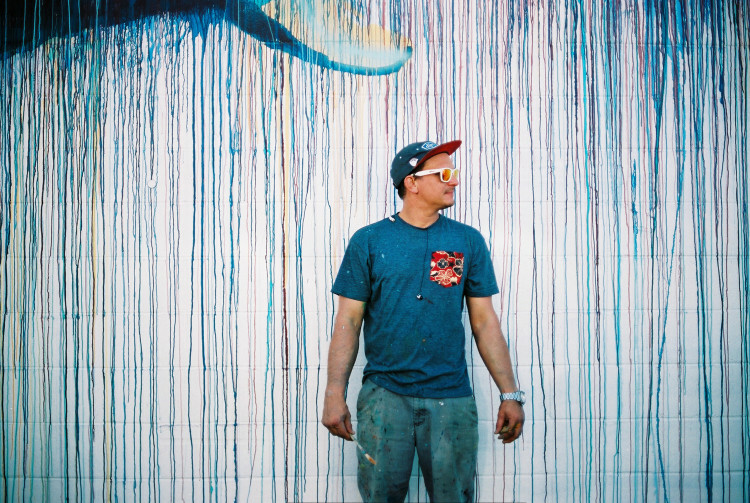 His paintings and murals tackle marine life, often sharks with a loose and flowing approach complimented with drips cascading down the work.